Last month, 14-year-old Ahmed Mohamed’s attempt to impress his teacher with a homemade clock landed him in handcuffs when officials at his school in Irving, Texas, thought it resembled a bomb and called police. His treatment resulted in international headlines, a heated debate over anti-Muslim bias, invitations to visit Facebook, Google, and the White House, and, now, a decision to move to Qatar where Mohamed was awarded a full scholarship. Mohamed and his family will move from Irving to Qatar in the near future. Mohamed had visited the country, along with Saudi Arabia, earlier this month amid a whirlwind of publicity surrounding his story, and toured the Qatar Foundation’s facilities. The foundation has partnerships with several Western universities, including Carnegie Mellon, Texas A&M, and Northwestern, which have satellite campuses there. 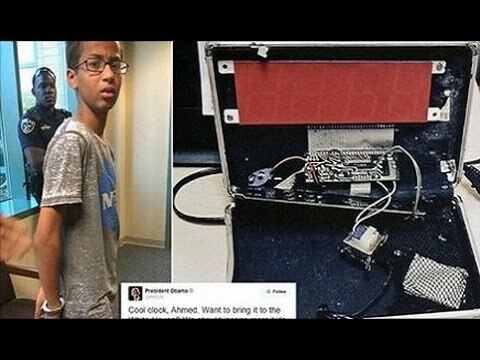 What is not mentioned in the Atlantic story and most other mainstream stories covering the decision of the family to move to Qatar is the controversy is that the claim the boy built a homemade clock has been strongly challenged by experts and the family was facing possible legal jeopardy. In a video, posted on the YouTube, electrical expert Thomas Talbot argues the clock is actually a commercial alarm clock, removed from its casing. Features of the clock such as the printed circuit boards and ribbon cables are indicative of a manufactured product, he explained. Fox News senior judicial analyst Judge [Andrew] Napolitano said that if the whole thing was a fraud, and the family was involved, they could be open to legal charges. “It now appears as though this was a purposeful hoax," Napolitano told Fox News' Megyn Kelly Monday. “If the parents were involved now you have a fraud going on as you have funds going on for him right now,” he said, adding that the two funds to raise money for the family now amount to over $20,000. It should be noted that Qatar does not have an extradition treaty with the United States.